Sweet Wine Wednesday, a Glasgow-based wine trade tasting group, has been on the go, sporadically, for nigh on ten years, and for most of that time it's been a running joke that one of us would threaten to bring along his vertical of aged Marlborough Sauvignon Blanc. We tasted three vintages of Villa Maria Clifford Bay Sauvignon Blanc, the 2001, 2002, and 2003. The oldest of these was bottled under cork. All three were in very good condition, very clean and lively, with plenty of fruit still showing. I'd say that the ripe tropical notes of a fresh Kiwi Sauv had diminished in all of them, and green flavours were much more to the fore. "Peas and asparagus" is a bit of a Sauvignon Blanc cliché, but it was very applicable here. For me, the 2002 was the most tart, and I found plenty of gooseberry notes, as well as an intriguing green chilli aroma. The 2003 rather reminded us of Riesling, in that it seemed to have a mineralic or petrol note, and a distinctly sherbet-like palate. But the real revelation, and my favourite, was the 2001, the last vintage of this wine to be bottled under cork. There was a richness to it, a creaminess, which I've never encountered in a Sauvignon Blanc before. It reminded me of rice pudding or lemon cream. It was wonderful. 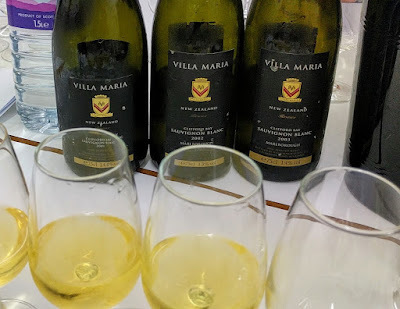 I can't quite credit that I'm actually writing this down, but the conclusion that we took away from this tasting was that we ought to lay down some Awatere Valley Sauvignon Blanc, with a label tied to the necks saying, "Not to be drunk before 2030".